Hell yeah! This is our 2nd interview with Dan Mongrain, the guy who replaced Piggy on guitar. He went in detail about the making of The Wake album which according to him took almost 2 years to be made. He also says that all of the songs are connected, and that this album has some sort of concept behind it. Dan described the music as „very proggy and intricate“ with „rich chord progessions“. Mongrain shares details about the lyrics for the song Sonic Myscelium. 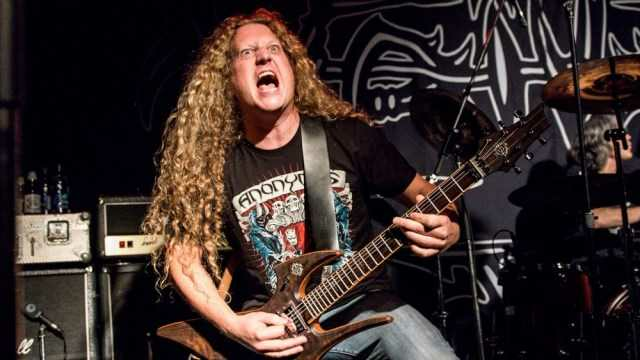 He also describes the influence he got from Piggy, and the way he writes music since he joined Voivod, describing his input on Target Earth album & Post Society EP. In the second part of the interview, Dan talks about the influence he got from Canadian death metal band Obliveon and his collaboration with producer Pierre Remillard. Then, the focus of the interview was put on Dan’s first band, the legendary Canadian technical death metal assault – Martyr. And of course, we just had to talk about albums Hopeless Hopes, Warp Zone and Feeding The Abscess. He also explained that the song Ostrogoth was actually a parody of death metal. Gorguts fans would be pleased to hear how he got into the band and that Dan actually wrote 1/3 of From Wisdom to Hate album. Dan also talked about Steve MacDonald and Steeve Hurdle and shared his view on the Obscura album. Mongrain also shared a story how he got in Cryptopsy. When asked about his vocal influences, Dan simpy said Chuck Schuldiner. He also revealed some of his biggest guitar influences and his favorite albums. And, guitar freaks will be pleased to get the info about Mongrain’s guitar rig.